The fourth UIAA Respect the Mountains event of 2017 was a significant one. For the very first time the UIAA’s flagship mountain clean-up project – partnered by KEEN – took place outside of the European mountains. The Manitoba province, Canada, provided the setting for this landmark occasion. Conceived as a project to encourage mountain users to unite and clean tourist areas of waste, the UIAA Respect the Mountains Series has grown in both its geographical reach and scope in 2017. Following on from the event in Canada, more non-European programmes, organised in collaboration with UIAA member federations are being conceived, while the events themselves increasingly focus on an educational message around the projects governing 7-Ways to Respect the Mountains. 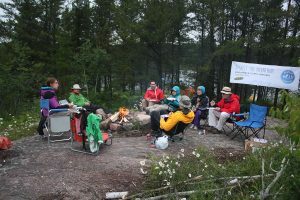 The event in Canada which took place on 24 June was organised by the Alpine Club of Canada (AAC), the Alpine Club of Canada Manitoba Section (ACCMB), and was held in conjunction with the 150th anniversary of Canada, an event celebrated on Canada Day, 1 July. The following report is courtesy of Peter Muir, UIAA Management Committee and Alpine Club of Canada member. The ‘C5’ plan was based around five concepts “clean up, climb up, culture up, cook up, and camp up”. The program was held on Saturday, June 24, 2017 to take advantage of the extended daylight hours just after June 21, to avoid Father’s Day and the Manitoba Marathon, and be as near July 1, 2017 “Canada Day 150” as possible while still getting maximum attendance. Unfortunately the rain arrived during Friday night and stayed through most of Saturday on an intermittent schedule. Luckily, although it appeared to be threatening rain all evening, it did not rain during the Saturday evening festivities. 26 brave souls of the expected/registered 46 attendees were not dissuaded by the weather. 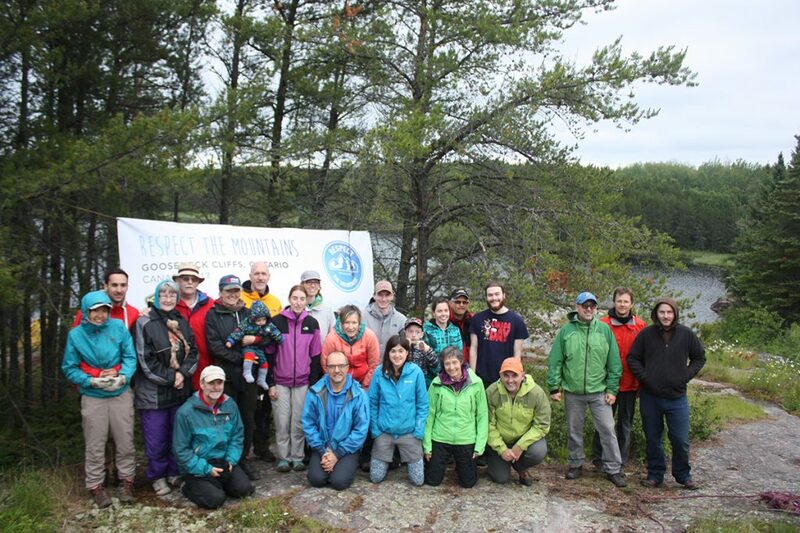 C1 cliff clean-up, trail restoration and area maintenance at the five main cliffs in northwest Ontario north of Lake of the Woods. The five cliffs were Gooseneck Cliffs (climb leaders Ray Hope and Robyn Roman), Roadside Cliffs (climb leader Mike Ducharme), Jones Rhode Cliffs (climb leaders Calre Dionne and Len Chackowski), Panorama Lake Cliffs (climb leader PM), and the Lily Pond Cliffs (in Whiteshell Provincial Park in Manitoba) (climb leader Brian Gilchrist). Each clean-up operation was scheduled for three to fours hours or earlier completion. Clean-ups were done at each cliff resulting in the accumulation of seven bags of garbage weighing about 25 kg and significantly one car running board. C2 climbing the cliffs from chores completion until a time that would permit those not on the Gooseneck Cliffs to travel to Gooseneck and the gathering at the camping area unorganized but known by climbers as “the Hilton” which is located on the rock shores of a first small lake on the north side of Signet Lake Road West of the Gooseneck Cliffs. Dean Yick, Education Officer of neighbouring Wabaseemoong (White dog) first nation. Was introduced to the crowd by myself as MC- thanking the first nation for allowing us to be guests on its unseeded lands which are now part of Treaty Three. A small presentation of tobacco as a sign of respect was presented to Dean. Dean spoke on the significance and meaning and spirituality of the cliffs to the indigenous peoples of his community end of the area. He reminded the assembled of the indigenous people’s traditional ways of treating the land with respect and as a foundation of culture and livelihood. He described for us the gift offerings that we occasionally encounter in the area including tobacco and asked us that we do not disturb these offerings. Dean encouraged us to remind ourselves of our need to treat the lands as guests and he closed by thanking us for our interest in his community before saying that we too should offer gifts to the lands as a sign of respect and as a reminder of our personal obligations to the lands. Len Chackowsky, geologist and member of the section provided an entertaining journey on the geology of Canadian Shield country in which we sat, from the Big Bang through creation of the solar system to our own extremely recent arrival. He had imaginatively mapped out the epochs using taped markings on a climbing rope-thereby figuratively giving new meaning to “string theory”. According to his theory the solar system was created approximately 20m from the end of the rope, just in the small stand of bushes immediately east of the fire pit. Brian Gilchrist, recent ‘leave no trace’ trainee and member of the section took us through the seven essential principles of ‘leave no trace’ using our own practices especially where done without thought as examples of easily changed behaviour. He kept the advice very practical and useful and many commented afterwards that they had not realized the simple things they could do or change to make a substantial difference. The culture education section ended the handing of presents to the presenters and a prize draw of items including ACC national supplied shirts, local section shirts, some small gear and copies of the 2016 Canadian Alpine Journal. Each guest received a few UIAA Respect The Mountains Series 2017 bookmarks (modelled on the “7 Ways to Respect the Mountains” Banner) as a small memento of their attendance. I made a special presentation on behalf of the ACCMB of an ACC icebreaker Merino wool sweater to Ryan Monroe and Mike Brown in recognition of their incredible work in the area over the last summer and into the spring placing many, many of the bolts we rely on. We made special mention of the fact that they had made it very clear that they only used UIAA approved and tested bolts. C4 cook up. Immediately following the educational festivities, the group enjoyed an excellent meal of hamburgers (beef or veggie burgers) cooked by the excellent hands of Randy Abbott, Mike DuCharme, Pat Dillistone and Annick Dionne. The burgers were accompanied by coleslaw and potato salad and excellent, sugar “off the charts”, dessert trays. C5 camp up. A good number of those attending sat around the open campfire after events spent socializing well into the night camping. The remaining people drove home.